Gigwam is a new camping tent business focused on the design and development of new and innovative camping products. Their first release – Gigwam – is a new and totally unique tent system that uses teepee tents which can be attached to each other using a unique tunnel system. Connection is easily made to any of the four access points on the Gigwam as there is a second zip to fasten the tunnels to the tent. Recently Gigwam featured on the BBC Series Dragons Den to attract one of their powerful investors to their current product and what they hope to product in the future. If you want to watch this episode you can on the iPlayer. We caught up with business owner, Dustin Toland, to find out what it was like to face the dragons, if he has any good advice for other aspiring camping and glamping entrepreneurs and to ask what’s next for his innovative company. Tell us about your camping business and product ideas. 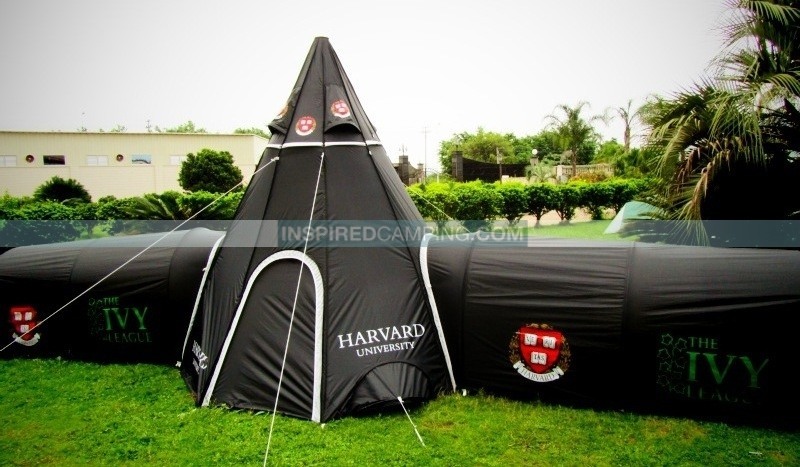 Our goal is to develop a range of tents and accessories that will appeal to all camping age groups and we would be particularly proud if our products were partly responsible for encouraging new people to camping. As you would know from Dragons Den we have released Gigwam, and of course Gigwam is primarily designed for the camping music festival market, but not exclusively and we are planning to release Kidwam early in 2013. Kidwam is simply a scaled down version of Gigwam and is designed to be used indoors and outside. A fully functioning tent that has peg points for outdoors and floor suckers for inside the house. Adapters will be available that allow connection between Kidwam and Gigwam, it has been made very clear to us that one of our unique features is the fact that our tents can be connected and parents are particularly keen on this for security of their children. A range of other accessories will include: an attachable canopy/porch to any of the entrances on Gigwam for shoes etc. Groundsheets that can be used between the connected Gigwam (a square sheet for use between four connected Gigwam and a triangular sheet for use between three connected Gigwam). A top bracket (this sits in the top of the teepee and houses the structural poles) that has a built-in LED. Air beds that are size and shape fitted to both Gigwam tent and tunnel. We also plan to release Bigwam, the 8 person version, in late summer 2013 for market testing ahead of 2014. Gigwam started as an idea because I was pondering the use of Teepee tents at festivals and then the name Gigwam came to mind, I was surprised that I couldn’t find any other products currently using this name. Then it appealed to me that a small/backpack teepee tent could work without the use of an internal pole to create more space in such an area and the idea of multiple entries to give way to connection using tunnels. I suppose the idea to link them came from the idea of each person carrying a reasonably lightweight tent, but when in a group you could still combine them on location to create a larger unit. By doing this you can share space, but retain privacy from each other. What inspired you to appear on Dragons Den? I think it would be dishonest of me to say I was inspired by the chance and more realistic to say that I could see the huge benefits of a high profile Dragons involvement and investment and if the terms were not agreeable or fair you may still receive the vast marketing and promotional tool that some air time will give you. However I have to say that even with the most calculated attitude to the advantages of getting to Dragons Den you can’t but to get caught up in the whole process and the very unique and special opportunity that it is. On watching the Dragons in the past you know they are speaking from massive experience in both winning and losing and I don’t think many investment seekers could come out of there saying they hadn’t at least been given some very good advice, even if it’s not always what you want to hear. Most viewers watch it and imagine presenting their own product / business ideas to the Dragons. Is it harder than it looks and what would you suggest to anyone seriously considering it? That is a very good question to ask me because I was very comfortable with the whole process, until I walked down those stairs and into the Den, then everything changed. I found it incredibly intimidating, I didn’t realise they were so close to you when you pitch and I found it very difficult to compose myself and concentrate on my details. I tried not to practice my pitch and script it too much, I remember being more of a donkey than a Joseph in my schools play when I was young. I opted instead to speak more off the cuff about the product I knew so well, but it was very hard to remain composed and I concede that I wasn’t that successful. I did however have it very clear in my mind that I would know my financials faultlessly and the reasoning behind them, ready for all of the awkward and tricky questioning the Dragons produce. Unfortunately this part of my pitch never made it to the final cut, but yes, for me it was a very positive and one-off experience that I would recommend to anybody who believes they have a good idea/product. Be prepared to be disappointed, accept that they may not agree with your belief in your business model or your product, but do you know what, you might just prove them wrong? Overall did you enjoy the experience? I thoroughly enjoyed the whole process and during the qualification stages you will need to gather much information about yourself and your business, but this is a useful exercise anyway and although it is time consuming it is ultimately going to raise the profile of your business and possibly pair you with one of the most famous business partners in the UK. Even though I ended up quite knotted with nerves on ‘show night’ I still very much enjoyed the experience of doing something I will probably not get the chance to do again. Did anything surprise you about the Dragons or the Den? Yes, it is smaller than it looks on TV and you stand far closer to the Dragons than I had expected. It is a long day and it mainly involves waiting around for your chance, this builds the inner tension too as you begin to dwell on what lies ahead. You spend the time before your turn sharing a room with the other investment seekers (I struggle to say entrepreneur at least to describe what I am doing) and one by one they begin to disappear, not to be seen again until the show airs on TV. I had some advantage over other participants that I met, my ‘props’ needed more setting up than some others and that meant I was able to enter the Den during a lunch break to set them up and gain some feel for the set. However it didn’t seem to make much difference, as soon as I came down the stairs it was immediate to me that this was going to be tough! You didn’t accept the offers made by both Deborah Meaden and Theo Paphitis to invest in your company for £100k in return for 45% of your company… a brave and bold move. Why was this and do you regret it in hindsight? With the fullest of respect to both Deborah and Theo and not just the investment they were prepared to make but the experience they both have of business, along with Theo’s retail knowledge coupled with Deborah’s knowledge of the leisure industry I wasn’t prepared to release 45% of Gigwam. The right decision? I said following the show that only time will answer that question. I’m a firm believer of living with your decisions and I don’t really see any benefits to regret, you cannot change the past, you can learn from it, but you must do what you believe is right and stand by those decisions, I hope that showed in what I did. I really believe in Gigwam and the future of the other products and I must do everything I can to makes sure my products are of a high quality and arrive to customers in good time. I must also do everything I can to promote Gigwam in the correct manner and beyond that the overall success of Gigwam depends fully on the public and if customers want to buy these products. If they do not then it will surely fail, but so far it has been wonderfully received, sales are very good and I am very confident 2013 will be a year of great progress. All of these challenges would have been met far easily with the Dragons on board, that is for sure, but the challenge is still there, it is on my shoulders and I look forward to it. What have been the positive aspects of appearing on the show? The response has been overwhelming, the opportunities that have already been created are amazing, the support from email, twitter and Facebook for me and Gigwam has been very encouraging and I am struggling to catch up just now. I am trying to send a reply message to everyone who has sent kind works and probably this won’t be possible, but I’ll try to, because I’m very grateful, no one is without some self-doubt and encouraging words make a big difference. Would you do it again if you were given the chance? I don’t think they would change their offers, but sure I would. I think it’s like anything, I would be more composed next time because I would be knowing what to expect, I probably wouldn’t change much other than my composure, but I would be more comfortable. I will never be as good at it as some of the others, but I’d be better than I was and just as I understand that the Dragons would not alter their final decision I can that I would not have change my decision either. The only addition would be that in this time the patent would be in place and from I could tell it may mean that Peter would have made me an offer too, now that would be interesting!!! What would be your top 5 tips for aspiring camping and glamping business entrepreneurs? This is difficult, but amongst a mind of imagination and vision be realistic. Be as sure as you can be that you are on the right path to success, there are no guarantees that it will work (I am not there yet either), but I can guarantee it won’t be cheap to bring a product to market. You will have doubts and in these times take a serious look at what you are doing and ask yourself if you are correct, if this ends in an affirmative, then go for it and my best of luck to you! !